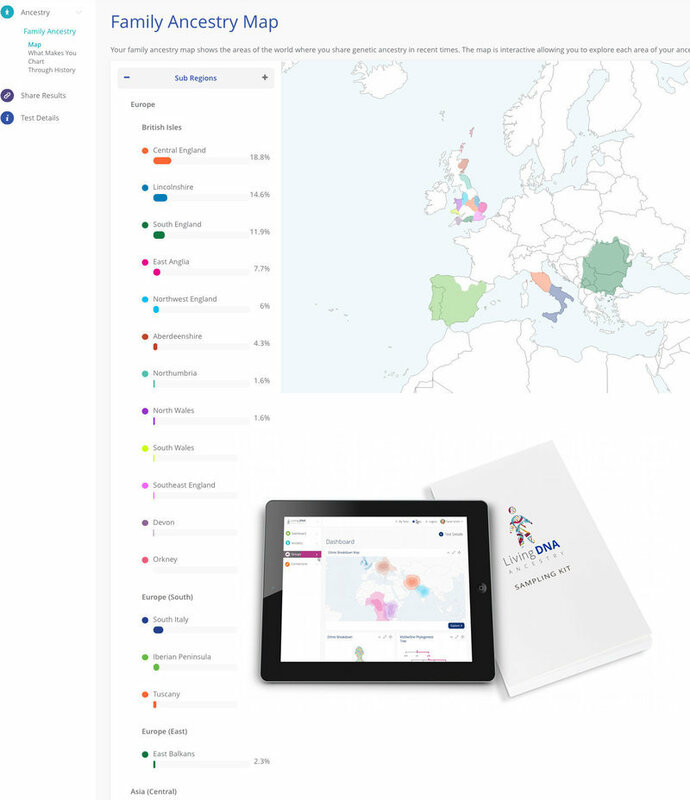 My Global 10 Genetic Map - and Frenchness! This is my position on the latest genetic map by David Wesolowski, of the Eurogenes Blog. One point of interest that has been picked up on the Anthrogenica Forums, is my consistent closeness in ancestral results, to a Normand member! 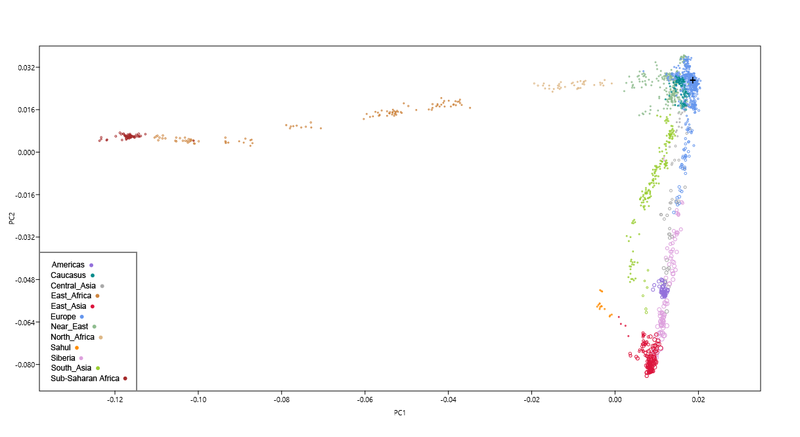 Our Basal-rich K7 results were almost identical. 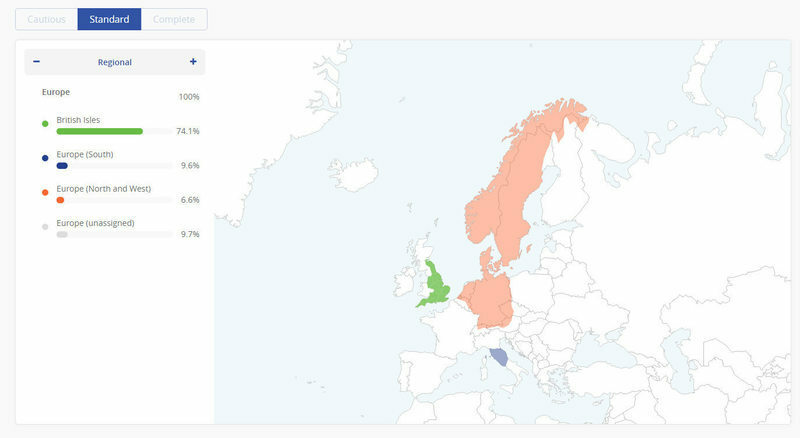 On 23andMe Ancestry Composition (spec mode), I just get a bit more French & German, while he gets just a bit more British & Irish. We are close! I had to point out though, that I've rarely seen other SE English with a record of local ancestry, test - and that the red circles representing British & Irish include many people with some Irish, Scottish, Welsh, Western, or Northern ancestry. The map suggests a pull to Northern France, Belgium, and the Netherlands. As I commented towards the end of my last post, I initially expected a pull to Denmark, Northern Germany, and perhaps to the Netherlands. This is because so many of my 17th-20th century ancestors lived on what was the frontier of Anglo-Saxon and Danish immigration during the 4th to 11th centuries. 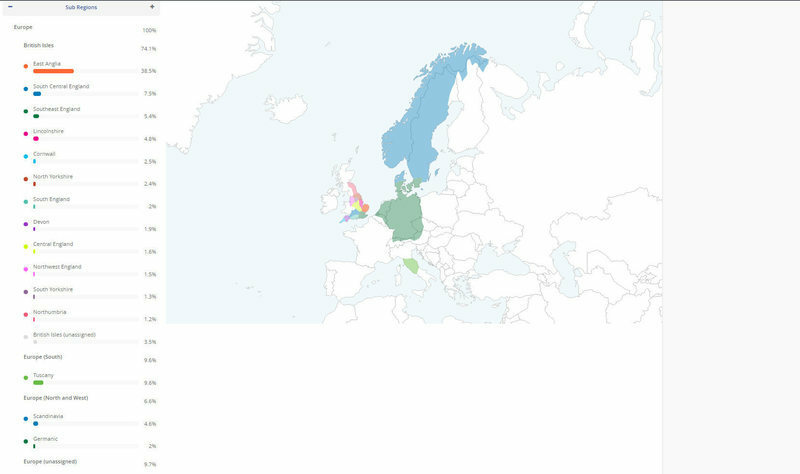 But instead, autosomal DNA tests for ancestry all seem to be suggesting more shared ancestry from a more southerly direction - Northern France and Belgium particularly. Although there has so far been a dearth of local testers from local families, the POBI survey seems to find this common among the English. We appear to be a halfway house between Old British, and the French, more than the ancestors of Anglo-Saxons and Danes. This contradicts the historical and archaeological records. POBI suggested that this was due to waves of unrecorded immigration from the South during late prehistory. Others have pointed the finger at Norman and French admixture in medieval Southern Britain. It could be both! Can I apply for French citizenship? You might think that following my recent posts, that I've lost all faith in DNA testing for Ancestry. Not at all. I just object when people take the analysis results of autosomal DNA tests for ancestry, as infallible truths. They are clearly not. So far this year, I have commissioned two 23andMe tests, and three FT-DNA tests, a FullGenomes analysis, and a YFull analysis. 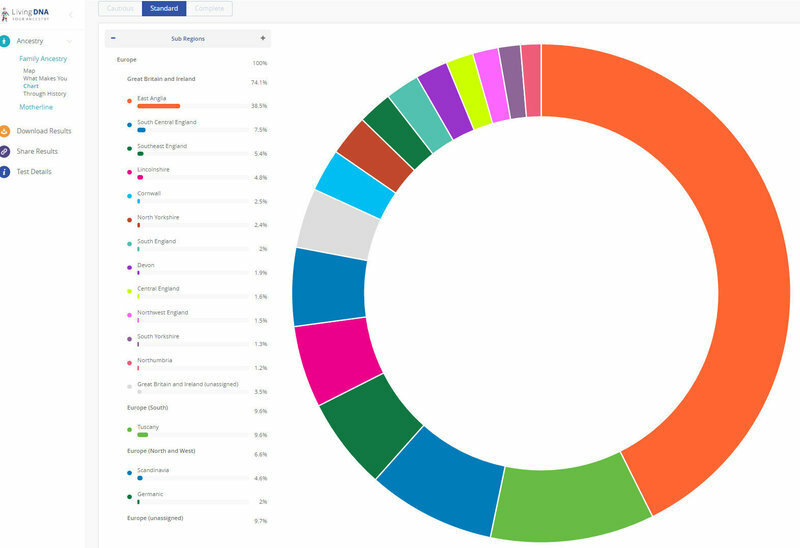 I have also used free analysis at WeGene and DNA.land, and have run three raw files on GEDmatch calculators. You'd might also think that I've done enough testing for one year! I thought that as well. Then a new service just entered the market. Living DNA Ancestry attracted my commission on two particular points. 1) it has an incredible British reference, that promises to break ancestry composition into 30 British regions - in addition to global analysis. If it works, then this is a must for people with significant British ancestry. 2) it uses the latest cutting edge test chip. The latest Illumina chip based on Global Screen Array (GSA). In addition, it uses a European based lab (Denmark), it tests Y-DNA, mtDNA, and autosomes. It tests more SNPs on all three counts, than other current chips used by competitors offering autosomal plus tests. Raw files for the test results will be available for download. Living DNA will be using a British reference broken down into an incredible 30 regions, across England, Scotland, Wales, Orkney, and Northern Ireland. 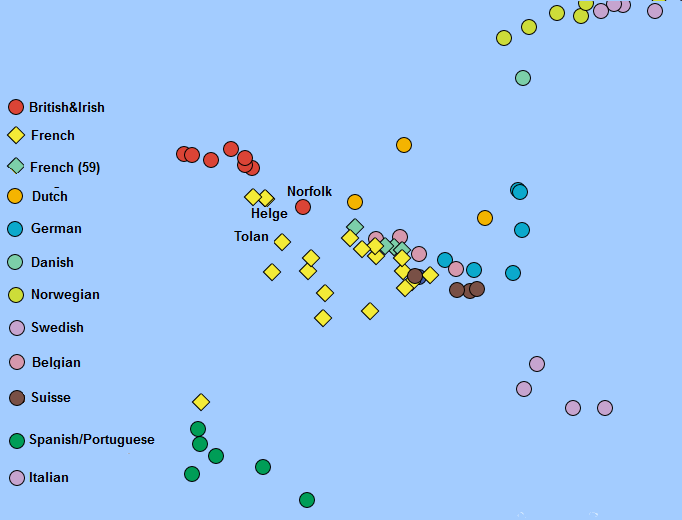 The reference uses the much heralded POBI (Peopling of the British Isles 2015) data set. This project collected 4,500 blood samples from people that could claim four grandparents in the same area, from across the regions of Britain. The British reference does not include the Republic of Ireland. However, LivingDNA are confident that they have collected a good global reference, and I understand, that they are seeking a similar quality Irish data-set for the future. In comparison, other providers of DNA tests for ancestry, only reference to Britain, or the British Isles & Ireland, as a single reference point. And as can be seen by my previous posts, with limited success. They also hope to provide imports for formats of raw file from other test companies in the future. LivingDNA do not themselves currently offer relative matching, or health information. Their service is for now, primarily for ancestry. I hope that LivingDNA will also use up-to-date haplogroup nomenclature and information. 23andMe with their V4 chip still use very dated 2009 nomenclature. So, let's see if this new service is any improvement to my results, compared with the hit and miss of 23andMe, and Family Tree DNA (FT-DNA). Will they be able to identify and locate my English roots successfully? What will the improved chip make of my haplogroups?